Bring the turnips and potatoes to a rolling boil. Continue to boil until both are fork-tender. Drain. Add remaining ingredients and mash until desired smoothness is obtained. Cover and keep warm as needed. Melt the butter in a large skillet. Saute the onion until well caramelized but not burnt, about 10 minutes. Add the flour. Stir. Cook 1 minute. Add the stock and cook, stirring occasionally, until thickened. Place 2 bangers on top of a mound of turnip-potato mash. Spoon gravy on top. Serve immediately. We went to England last May and spent a few days in London and Bath with Matt's family. Due to various reasons, we did not get to do a lot what we wanted and saw none of the major tourist attractions! No Big Ben, Buckingham Palace, Tower of London etc. We did go to Windsor on a dreadfully cold, rainy day so we did see one castle but we missed out on quite a bit of the stereotypical British experience. We made it to the Jewish Museum, the V & A Museum of Childhood, the British Library and the Foundling Museum which were all excellent and when in Bath and Windsor we did (finally!) make it to a few pubs. In Bath, I had some Cumberland sausages and mash in a hipster-y pub that were very good. I also had a tuna and sweetcorn stuffed baked potato (they were everywhere!) which was oddly good, a Sally Lunn bun and a full English breakfast at our hotel. So Bath was pretty good for British-y foods. We did not make it over to Ireland (which was my suggestion for the family trip!) which is a shame. 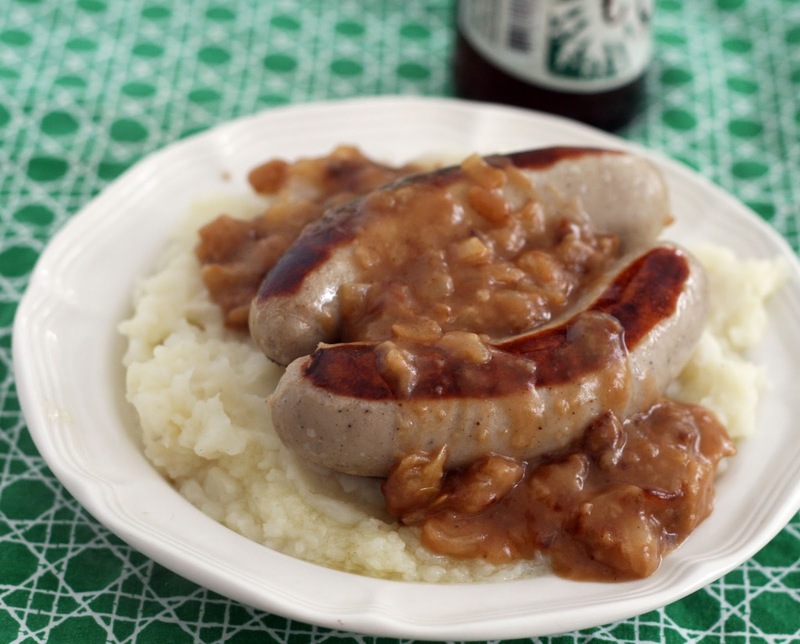 The trip did, however, cement my love of sausages, mashed potatoes and gave me a new found appreciation for onion gravy. Irish sausages are not something we often see here but near St Patrick's Day bangers are often available at Costco and Aldi so I picked some up. Straight bangers and mash is a wonderful thing, but if I am making gravy from scratch (for the second time this week!) I didn't want to make a second side dish. So into to the mash went the turnips. You really can't tell they are there but they are providing some nice Vitamin C and fiber for you. Since St Patrick's Day is tomorrow, this is a more authentic (and easy!) dish to make than corned beef and cabbage, which I love but that they do not actually eat in Ireland.